The Splendid Kitchens team can assist you with the complete design and finish of your new kitchen. From start to finish, we are here to help every step of the way. Alternatively you can enlist in our help for only a few chosen services, however we advise against this, as when we complete the entire project we can ensure your kitchen is finished to an agreed timeframe and budget, as well as ensuring the quality is up to our very own high standards.
" OLD TO NEW IN AN INSTANT "
We will supply trusted tradesmen who will ensure all of the technical aspects are taken care of, in a professional manner. 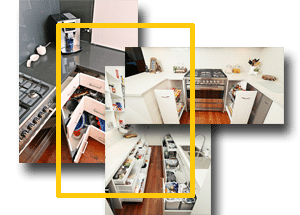 Our installer will fit your kitchen with your chosen cabinets and products. A detailed inspection will be done, ensuring everything is up to our very high standards. The part that makes our job all worth it – your kitchen will be ready for you to take over! As you can probably see, we have a very comprehensive process we follow, which ensures no stone goes unturned! Get in touch with us today to book in for a consultation or to find out more! Splendid Kitchens is a great choice for all of your kitchen design needs in Melbourne. We can take care of every little detail, right from planning, through to manufacture, installation and completion. We will manage the entire kitchen project, which allows you to focus on other things. Take the stress out of your job, enlist in the help of Splendid Kitchens to make your next project easier. Get in touch with us today to find out more! We understand that new home builds and renovations can be a pricey and stressful venture which is why we enjoy offering our clients unlimited benefits. We run a variety of promotions, periodically, in order to ensure our clients can save money where and when it is possible. We always strive to offer premium kitchens at affordable prices. Get in touch with one of our team members today to enquire about our current specials! This is the very first step, perhaps the most important. Our designer will visit your home, consult with you, give you ideas, measure everything and provide you with a quote. Our designer will assist you in choosing a colour palette and materials for your new kitchen, providing you with samples and swatches. A second measurement will take place, as a precautionary measure, to ensure everything goes to plan. We will begin processing your kitchen at our specialist manufacturing facility. If you are undertaking a renovation, our team of experts will come in and ensure your kitchen is bare and ready for the new one to go in.